Liberation Route Europe has been nominated for the History Online Award! Unique stories about Europe’s liberation at the touch of a button. Liberation Route Europe has been nominated for the History Online Award! Will you help us win this award? The History Online Award honors the best historical website or app in the Netherlands. With more then 20.000 votes, it is the most popular History Online Award of the Netherlands. 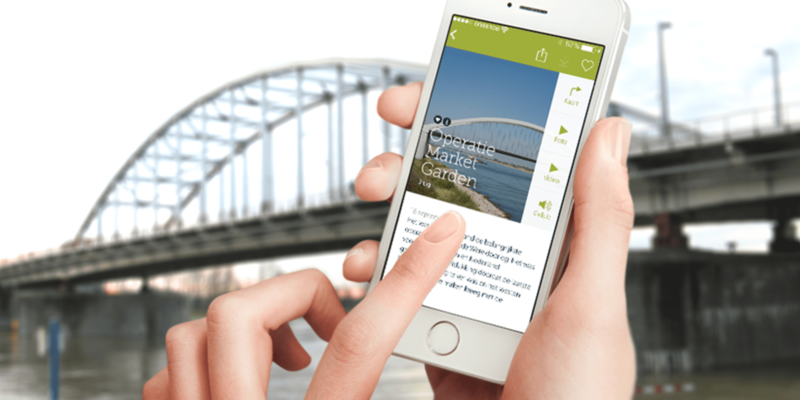 Liberation Route Europe provides unique stories about Europe's liberation at the touch of a button. Storylines, sights and historic events, all combined in an app for Android and iPhone. This app uses GPS technology to give its users information about the happenings on the road to a free Europe, based on “spots” (locations), biographies and storylines. This way, visitors literally follow the liberators’, or even the oppressors’, steps. This is because the app’s content and the website aim to show each story from both sides. With this international remembrance and liberation route our shared history is uniquely made visible, accessible and ​​tangible. Dutch minister Hennis-Plasschaert finds the Liberation Route Europe ‘a pearl’. “Because of the app it is possible to rediscover the route the allied forces took." She hailed the initiators during her speech in Arromanches. “With this international remembrance and liberation route our shared history is uniquely made visible, accessible and ​​tangible. Advertising and digital agency One Shoe from Utrecht realized the unique historical app. Can you help us win this award? Click here!